Re: SC-88Pro: ZUN's MIDIs the way they were intended to be heard. These MIDIs now sound beautiful. I listened to a couple of my personal favorites, and the SC-88 Pro adds a certain touch that even the originals (both MIDI and WAV) just don't have, with amazing quality and little to no noise to boot! Return of Eastern Wonderland! Made by a PC-98 fan FOR fans! To put my thanks into perspective: This thread was the motivation for me to finally make a proper Maidens of the Kaleidoscope account in the first place. I was ecstatic to see someone put this kind of time and effort into showing us these wonderful musical tracks in the way they where honestly meant to be listened too. "But then again, if you don't listen to it with an 88 Pro, it's pointless." I admit when I first heard these songs and had a Windows XP to have a proper listen that I was cozy with the idea that I didn't need a 88Pro to hear the full glory, I was wrong. The fact that you got a device to play these and spend many hours just to record these in lossless audio has me more thankful than you could ever hope to believe. I've heard tracks that I've never heard a version of before and I've reheard tracks with a new way of hearing it, and all in all, this has been an enlightening experience for me, and is easily my highlight of all of 2016. Are you okay with these songs getting uploaded to platforms like YouTube under the guise that this forum post is credited? Truth be told this is something I really wanted to do myself, but of course, I would want this to finish first, and also for your own word on what you would want if people did want to upload this to a video/music sharing platform. This could extend to other platforms like Niconico and such if someone has any interest, but I'd like to know your say on that matter. Will you be making mass download archive files of all the songs of a particular group featured in this thread, or allow them to be created? Of course downloading one by one is something I was okay doing since I have wonderful download speed and time for it, but some out there would like those giant downloads with all songs in one pack for convenience sake. Let me know your stance on this for this since having that would allow my own friends who show interest to have a slightly easier time getting all of these songs in one fell swoop. Is creating tracks here in .mp3 format and distributing them for download alright with you? Nowadays .mp3's are considered the norm of accepted audio file format when it comes to non-lossless audio compression. The compression of .mp3 helps those with limited storage space since those under .wav .flac tend to be huge files and not all hard drive can handle the size. Needless to say quality wise I do indeed prefer .flac myself since it's of the highest quality, but a large part of my own music library is .mp3 on things like my laptop due to this reason, but the distribution of those files is something I ought to know your thoughts on. Lastly, are the MIDI sequences from Touhou 7 PCB to Touhou 9 PoFV going to have their tracks recorded on your SC-88Pro and posted on this thread? I guess this question speaks for itself without need for clarification, but of course I know that PoFV only had MIDI sequences exclusive to the trial version and not the final game. Sorry for all the questions though as I carried on quite a bit. 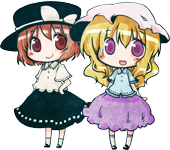 ＾＾; I ask you these questions in hopes that your hard work is more widely appreciated by those who are yet unaware of the musical marvels on this side of classic Touhou (and Seihou) since you say in your introduction to this thread that "Here's an era of Touhou history that doesn't get talked about much". I've been really sadden that people still haven't given things like Seihou and Touhou MIDI sequence music the light of day for how honestly amazing it is, but I'm sure with a thread like this, it's now possible to show people ZUN's music at it's best because you indeed showed that to me. Oh, and best of luck finding and obtaining the C60 Kioh Gyoku Trial music! I'm a decade-old Touhou Project fan. I heavily advocate for what's obscure and less popular in this series such as the PC-98 era, not-often-heard ZUN music, and the much of unpopular/unused characters. I was planning to upload these to YouTube myself. I have the knowledge and tools to make the videos sound as close as possible to the original FLAC files, so I would prefer if nobody else uploaded them. I'll be uploading one big archive with all the FLACs in 16 bit. That should halve their size. I'll be using a studio grade dithering algorithm included with Wavelab Pro 9 before conversion, so they will sound identical to the original 24 bit files at normal listening volumes. I'll upload high quality AAC (.m4a) files soon. AAC is the successor to MP3, It should be supported by all good media players and it's usually just plain better than its predecessor. If the one you use doesn't support it, it's probably time to update or switch to another one. I might record the tracks from the PCB trial, but every MIDI after that sounds like it was edited for the 88Pro in just a few minutes, so I think it would be a waste of time. If it wasn't for the downloadable versions of the trials, ZUN wouldn't be touching his 88Pro at all at that point. Contrary to what certain individuals seem to think, ZUN didn't stop making 88Pro versions of his tracks because people were stealing them to make arranges, he obviously just didn't want to waste time making them at all. Note that the full version of PoFV did have MIDIs, but only the ones that were included in the trial. I have the knowledge and tools to make the videos sound as close as possible to the original FLAC files, so I would prefer if nobody else uploaded them. I'll be using a studio grade dithering algorithm included with Wavelab Pro 9 before conversion, so they will sound identical to the original 24 bit files at normal listening volumes. Oh wow, that sounds absolutely amazing; it'll be great to have. You're really going above and beyond with the bulk downloads and I think it's really awesome you're taking the time to make it count! I'll upload high quality AAC (.m4a) files soon. Ah yes, AAC, that slipped my mind there, my bad. ＾＾; I do have a few soundtracks in that format, and while I will admit that .mp3 is still really common, but I do acknowledge the other formats as worthwhile. I might record the tracks from the PCB trial, but every MIDI after that sounds like it was edited for the 88Pro in just a few minutes, so I think it would be a waste of time. Huh, that's interesting that's the case, but I guess this was when .wav versions really ended up being ZUN's preferred music style over the latter, so I'd say you made a fair point; glad to know that. I personally feel that it would be rather foolish and against your initial argument for starting this thread to skip recording the MIDI from TH07–09. You say that this isn't talked about much, and the MIDI for TH07–09 might continue to be ignored unless there is proper archival of them. You have the ability to change the musical perspective of this fandom and you already have partway; don't squander what's left! My perception of my work ethics. Here's the MIDI versions of the music for the trial versions of Perfect Cherry Blossom, Imperishable Night and Phantasmagoria of Flower View. These are the same as the ones included with the full versions. From PCB on ZUN composed and recorded his music using his new MIDI module. The SC-88Pro wasn't used at all. The only reason these MIDI versions exist at all was due to the circumstances at the time (distributing 150 MB trials over the internet was impractical). ZUN would probably prefer if nobody heard these, but here we are. Many of these have small differences in the instrumentation. The MIDIs for IN are missing some Special instruments that have no equivalent in the SC-88Pro, while the ones for PoFV also play the wrong drum notes because the kit ZUN used wasn't fully GS/GM compatible and he didn't bother editing that. Just wanted to add something. The MIDI for Stirring an Autumn Moon (Wriggle's theme from Imperishable Night) contains some unused tunes that are inaccessible in-game, as the song loops to the beginning way before these even come up. Oh hey look I can do DNH scrips. 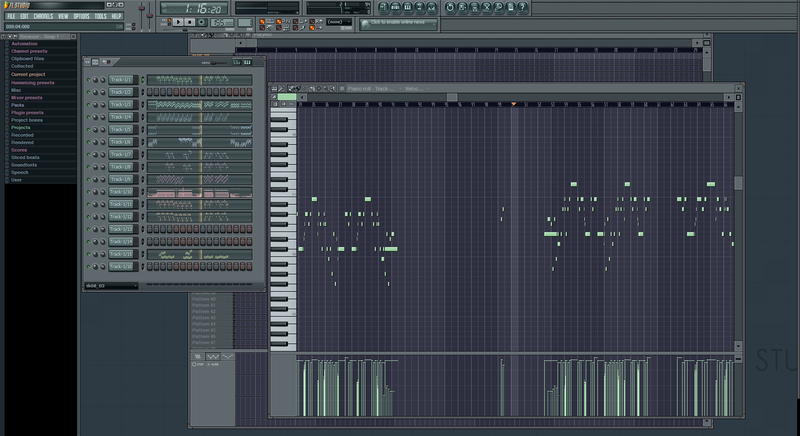 There are zero notes after the point where this MIDI is supposed to loop. That's just some crappy player and/or synthesizer glitching out. I've just examined a freshly extracted th08_03.mid from my trial version (using thtk) and it indeed stops at 1:16. What an interesting fact I was totally ignoring. I always thought they were made with some SC-88Pro compatibility in mind because of how they sounded pretty well on my 8820 and it appears not. That makes those MIDIs even more interesting, because they were kind of "deprecated". Otherwise, I'm just speechless about the wonderful initiative of what you did by recording all those MIDIs with high-end equipment and from your SC-88Pro. Also, the fact you recorded them without any compression makes them even more desirable (I've gotten allergic to dynamic compression over the years, to the point I'm doing transient restoration pretty often) and nice alternatives to some heavily compressed stuff even ZUN himself provided (th07_18 comes to mind). FM synthesis rocks. My blog. -All other MIDI files have the same "last modified" date (the date and time when they were ripped), except this one, which was last modified over 2 weeks later. -It's in MIDI Type 1 format instead of Type 0, which ZUN used for everything else. -The track names are unlikely to have been set manually, but they don't match Cubase SX's default track names at all. So basically this is probably someone's attempt at an arragement that somehow slipped into a pack of ripped MIDIs. Chiming in to inform that I've listened to the entirety of the music posted here at last. However, while I was listening to some of the music tracks, it seems that the arranged version of Dichromatic Lotus Butterfly ~ Ancients and Velvet Maiden Battle ~ Velvet Battle has some uncomfortable noise in their tracks. Dichromatic was quite noticeable whilst Velvet Maiden Battle was more minor, but noticeable on higher notes. Meanwhile, there is a slight skip in Tabula rasa ~ The Empty Girl 3:02 into the track. Other than what I mention, there isn't any more issues, so the rest of the music tracks are fine from what I can tell. I tried to be as thorough in finding issues, but I could have easily missed a thing or two somewhere, but the issues in the track I mention I'm certain of. In other news, I've got listening to the PCB through PoFV trial tracks too; I quite like how they sound, so thank you for recording those too; interesting that the full game MIDI sequences ended up going with a different module outside the trials, but eh, given ZUN's stance on MIDI music, it's apparent he likely would have moved on from it sooner than later after EoSD at the very least had the aforementioned circumstances of downloads not been in place that keep MIDI around. I do wonder what it would have been like if ZUN had gone the distance with them, nevertheless. I didn't expect that ZUN wouldn't want people to hear it. I do think that, after a good listen, they did sound good off this all things considered. I'm happy I hear these because I've really come to appreciate and enjoy how the SC-88Pro makes these songs sound, so interesting probability of that preference for ZUN to be sure. The skip is a bug in VLC, no other player or audio editor I tried does that. The high pitched hissing isn't a recording error. The SC-88Pro sounds infamously muffled, so it was common for Japanese composers to crank up the LPF resonance of multiple instruments. This was the only practical way to boost the overall high frequency content in a MIDI file intended to be distributed on the internet or floppy disk, since the 88Pro (like nearly every other synthesizer at the time) lacked a dedicated equalizer for each channel. This is of course not a very transparent or precise method of high frequency boosting. In this particular case, ZUN combined this resonance with a high frequency boost from the insert effect he applied to the violin and another high frequency boost from the master equalizer (which is applied to everything). In other words, the resonance in this track is fairly loud, and how annoying it will sound will depend on your speakers or headphones. Cheaper speakers almost always have barely any bass and weak, uneven mids, so the loud resonance spike in this track will easily overpower everything else, or at least it will be a fair bit more audible and distracting than it's supposed to be. Thanks for looking into that; I didn't expect VLC to have this bug since most other audio files I have worked fine, but I guess I should be using my foobar2000 program like you recommended for these. Originally I did listen to Dichromatic Lotus Butterfly ~ Ancients through an aged USB headset with my only microphone. I listened to it on much higher quality headphones and it did make a difference, which prompted my recent edit to the original post about this. The edit you made did indeed make enough of a difference to make me want to listen to this that version instead over the other one. Thankfully I can live with Velvet Maiden Battle ~ Velvet Battle as it is more soft with the hissing, and even more thankfully all of the other songs do not have the same thing going on. I know little to nothing about the SC-88Pro outside of what you have said, so this insight is indeed good to know in the interest of those tracks I mentioned. I've uploaded everything to YouTube. The first video will automatically play when clicking these links. I recommend using the "Default view" player mode, and as stated in the first post, increase the volume on your audio hardware a little. When sharing these videos with others, please use the playlists when possible. This makes it easier for people to listen to other tracks from the same game if they want to. YouTube's recommended videos feature has unfortunately become useless for this. Care was taken to ensure that these sound as close to the original FLAC recordings as possible, and to keep possible clipping introduced by YouTube's unavoidable lossy audio compression to a minimum. I kinda forgot about Audio 101 while doing so though, so a few videos might have a short click at the beginning, which hopefully isn't a big deal to anyone. And here's everything in 16 bit FLAC and AAC. If you have a slow connection and have to download from MediaFire, consider installing Free Download Manager. MP4 lossy audio. Official closed source Fraunhofer IIS encoder. The 16-bit FLACs should sound the same as the original 24-bit recordings for as long as no further audio processing is applied. This includes dynamic range processing, equalizing and encoding to a lossy format such as AAC/OGG/MP3. If you downloaded the 24-bit versions previously and you don't plan to do any of that, feel free to delete them and download the zip file above. And that's it. I guess I can go get drunk now. I guess that's it for now indeed. Well, that's definitely not going to stop me from relishing in this forums hard work for many years to come. You going out of your way to get yourself an SC-88Pro and the important knowledge needed in regards to this topic is something that has on my part been very much appreciated; your dedication to what some may consider a more niche part of Touhou and Seihou is truly inspiring. It's truly another keystone example of the dedication people have for Touhou and this was entirely you being awesome throughout. I hope that the one thing that's keeping this series from true completion can come to accessibility one of these days, so I will eagerly await the news of that. If I can say anything more now that's it's reached this point, it's that your YouTube channel is currently showing only your feed. If you enable the "Customize the layout of your channel" option through the cog next to the subscribe button on your channel page, you can enable the tabs that show "Uploads" and "Playlists", as well as opening a "Discussion" tab for channel comments and an "About" tab for your channel so it isn't so watered down by YouTube as channels now are by default. That's really all I have to say, so I'm going to take the time to organize this music and update the metadata for myself to the English equivalents; afterwards, I'll be sure to spend a fair amount of time listening to these. Of course, I'll consistently take the liberty to share this work with others every chance I get, too. I just have to thank you again, Romantique Tp. This has been a truly fantastic collection of amazing efforts on your part, and I'm glad I've lived to see this part of Touhou and Seihou rekindle in the way it has since it's so obscure. I may have already given you my sentimental thank yous, but I'll truly be forever thankful to you for this. Someone pointed out that I had forgotten to upload the WAV version of the Kioh Gyoku (Seihou 2) soundtrack, so here it is. This list should make it easy to compare the original SC-88Pro MIDI versions with the arranged WAV versions. The links lead to YouTube. ZUN processed the WAV versions (limited or clipped), so it's going to sound louder than my SC-88Pro recordings if you don't touch the volume. The WAV version of this soundtrack is the point where ZUN stopped using the SC-88Pro. He bought his new synth in late November 2001, so he only had a few days to figure it out and arrange everything he had composed so far in time for Comiket. The game was going to be sold on December 30. Both versions of the soundtrack have almost completely different instrumentation from each other. The SC-88Pro MIDI version is closer to Shuusou Gyoku in style, featuring prominent organs and square waves. These are almost completely missing from the WAV version, where there's a lot of piano, violin and cello action instead. This game's soundtrack isn't bad. Give at least the WAV version a listen if you have never heard it before. If you compare the WAV versions to the other recordings in this thread, you can get a rough idea of how the instruments in these MIDI modules have evolved over time. Speaking of the SC-88Pro recordings, those who have heard a bunch of them may have noticed that something seems to be missing. Well, there's a first time for everything... I would say that the WAV version of Holy Knight of Orléans sounds pretty romantic. Re: (!) SC-88Pro: ZUN's MIDIs the way they were intended to be heard. I recorded the official demos for most of the synths relevant to this thread and uploaded them to YouTube. They'll give you the chance to hear a few of the hundreds of instruments from these modules which were never used by ZUN. I'll also talk a little bit about them on the post below for those who may be interested in buying one, or for the curious. If you plan to buy any of these, avoid screenless versions. They're usually only slightly cheaper, they're a pain to use and all of them have worse DACs (noisier and less accurate audio) than the regular versions. Of course, these are all in massive overkill quality like always. A list of the instruments and effects used in each demo can be found in the video descriptions. Note that most of these demos show off more than what's implied by their titles. To the people who subscribed to me, I'm sorry if this makes your inbox explode or something. I have no idea how this stuff works. This post looks big and scary, but it's actually not that long. I'm just bad with lines. I swear. Released in early 1991. You're probably already familiar with the sound of this one, even if you've never heard of it before. The stock Windows MIDI and Apple QuickTime sounds are lower quality versions of sounds from this module. There's no real "synthesis" going on in these software versions, which is one of the reasons why they sound so bad. This is probably the best selling sound module of all time, but ironically it's one of the least heard on recordings. If you think you're hearing one, you're most likely actually hearing some 80's Roland synth. None of the sounds from this module were recorded specifically for it. They all come from other Roland products, and most were recorded around the mid 80's. About 8MB of sounds had to fit into only 2MB of ROM, so of course there were a few... casualties in terms of sound quality. But overall it doesn't sound bad for the time. A minor upgrade, SC-55mkII was released in early 1993. It has a few new variations (based on samples that were already in ROM) and a less noisy, but slightly different sounding DAC. I recommend the old SC-55 to purists, but the SC-55mkII should be fine to those who play old computer games regularly. Both are very cheap. No other Sound Canvas can play SC-55 MIDI files accurately. Released in early 1994. This module has improved reverb and chorus effects, a new global delay effect and a new synth engine. Needless to say, it cant play SC-55 MIDIs accurately, even on the "SC-55 MAP" mode. And to make things worse, they actually ran out of ROM space for the new sounds, so a few of the SC-55 sounds had to be replaced, the most infamous examples being the strings and choir aahs. This has been inherited by every Sound Canvas released after it. Virtually all acoustic instruments have new samples on the "SC-88 MAP". The samples come from the JV-80, an early version of the most widely used pro module of the 90's (the JV-1080), and the first five of its expansion boards. Many of the sounds in these demos should sound instantly familiar if you played 90's games (or even many from the 2000's) recently. The JV strings, french horns, harp and timpani for example can be heard in hundreds of recordings, both old and new. Many sounds had to be cut down to fit into the ROM (either there are less samples spread across the keyboard or they start looping sooner), but most are still recognizable. Most of the demos are 32 channel, but many home setups at the time could only output to 16 channels, so a portion of the SC-88 userbase never got to hear them properly. ZUN used this module for all of his MIDI work before 2000. He likely also used it for previewing the drafts of his PC-98 compositions before transcribing everything to MML. The SC-88Pro sounds exactly the same as this module with "SC-88 MAP" activated, thanks to it using the same base synth engine, the same DAC and most of the same components, so the SC-88 is completely obsolete! Released in late 1996. This is the star of this thread. People in the west love calling this just "SC-88", but it's actually a pretty big upgrade to that. New to the 88Pro are insert effects (such as guitar distortion), which allow composers to set themselves apart from the crowd by giving them more sound mangling or enhancement possibilities. One insert effect can be used at a time. Most of the important instruments had their samples replaced with the new stock samples from the JV-1080, and as well as even more high quality samples from expansion boards. The instrument programming is still absolutely nowhere as good as the JV series, but Roland was a lot nicer about the whole sample crippling thing this time around, so the new sounds are for the most part straight upgrades over their "SC-88 MAP" versions. It had the first good piano in a home user-oriented module. This module was a mega hit in Japan, and its popularity grew even more ridiculous in the late 90's after it was revealed that Nobuo Uematsu used a vanilla SC-88 for the music of Final Fantasy. About 95% of all japanese MIDIs are made for either the 88Pro or vanilla SC-88. This is hands down the best module for those who want to listen to MIDIs at consistently good quality. It rarely sounds astoundingly amazing, but pretty much everything sounds at least decent on it. The screen and the buttons on the front make it easy for even the most clueless person to switch between the SC-55/88/88Pro sound sets or make quick tweaks on the fly, for example while playing a game. Released in 1999. This has the same amount of new sounds in MB as the 88Pro, so it has to be a big upgrade, right? Well not really, because they used most of that space on the new stereo strings (which are admittedly nice sounding) and a hundred of filler SFX sounds and one-shot ethnic percussion to try to inflate the module's instrument count! Other than that you get a stereo version of the 88Pro piano, new harpsichord, clavi, music box, tubular bell, santur, harmonica, acoustic bass, sitar and some new organ variations. The solo brasses, oboe and clarinet have extra samples for notes played either softly or hard. It also has a few new poorly programmed ethnic instruments and drums many people didn't like. Overall, it still sounds too much like the 88Pro, but there's a catch: due to some synth engine changes, the SC-8850 is infamously unable to play many 88Pro MIDIs accurately. This module usually sells for up to 250 bucks more than the 88Pro. You're technically paying 250 more for a SC-88Pro that can't play MIDIs made for itself 100% correctly. Most of the time (depending on the track), half of the new samples don't sound much better than the old ones, and often they actually sound worse. I think it's a waste of money. The SC-8820 (released in late 1999) has much better SC-88Pro compatibility. It's missing nearly all of the new instruments from the 8850, but it keeps all of the filler SFX and percussion (lol). It has a few extra presets compared to the 88Pro, but most of them are just one old sound played together with another. You could do that yourself. By the way, it's also usually sold for more than a 88Pro. You're basically paying to lose the screen and all of the front panel buttons. ZUN bought a SC-8850 around mid-august 2001, and he used it in a grand total of 3 tracks. He most likely sold it to buy a new module on november of that year (he kept the SC-88Pro). He did mention liking the piano, but I think you can guess what he thought of the module as a whole for him to replace it in 3 months. WAVE ROM: 32MB (64MB uncompressed) - 24~ MB of new sounds. Released in October 2001. This module is half a synthesizer, half a high quality USB audio interface, and it's what I used to record everything in this thread. Despite the name and the fact that it was also aimed at home users, the Studio Canvas series was a whole new family of modules unrelated to the Sound Canvas series, and it has almost zero backwards compatibility with them. Nearly all of the samples from the SC-55 and SC-88 have been dropped entirely, along with the filler and gimmicks from the SC-8850. Most of the important instruments have new samples, including many samples from the then new Roland XV series. The XV samples have a higher sample rate and have less aggressive lossy compression applied to them, giving them a deeper, more vibrant sound. The instruments that didn't get new samples have been reprogrammed, and sound more convincing. Higher quality versions of both the SC-88Pro and SC-8850 pianos are included, and some of the samples that had to be heavily cut down during the vanilla SC-88 era such as the violin, cello, oboe and shakuhachi return in full quality. Even prehistoric synth presets such as Fantasia and Halo Pad got revamped. This module includes all of the engine features of the XV-5080, such as high quality SRV reverb, COSM insert effects like Guitar Amp Simulator (3 inserts can be used at a time) and the ability to customize every single parameter of a preset, or even create your own from scratch. The only thing that's missing is hardware expandability. Contrary to popular belief, this module actually has 3 different sounding trumpets, not just one. Don't buy this one if you only intend to listen to random MIDI files. It's wasn't designed for that. Released in 2001, around the same time as the SD-90. This DAW plugin includes a collection of pianos, guitars, basses and drums, and could be considered a software-based expansion for the SD-90. It includes some samples which were clearly considered to be included with the SD-90 but were left out due to the lack of ROM space, such as a new piano, a modern 6 string bass (fingered, slapped and popped), some guitar and bass noises and a bunch spanish shouts to go along with your mexican trumpet. Released in 2002. This is a module mainly intended for use with a laptop, and it's missing almost everything I mentioned above about the SD-90. Half of the presets are missing, including many important ones, and you're stuck with no insert effects and the lower quality "General MIDI 2" reverb and chorus. They also managed to make it somehow even less editable than a Sound Canvas, which were already infamous for being inflexible... This is just not very suitable for a primary module, and like the SD-90 it's not very good for playing random MIDIs either. Most of the demos for it are pretty cheesy too. I only recorded them because a few of the instruments used weren't featured in the SD-90 demos. Hmm, I doubt anyone here will interested enough to read even half of this, but hopefully this will be at least a little helpful to people who find this thread on google. This was written after a whole week of bad sleep. I might have to take another look at this post later. Fantastic write-up on the Sound Canvas line as always! While the 88Pro is indeed the recommended model, I wonder if we can also suggest or at least get input on iOS Sound Canvas and Roland SC-VA, considering they are software 8820s. Given that quite a few are using the latter for DOS gaming, I reckon that they'll be serviceable for some who may find the convenience preferable over complete accuracy. Additionally, as an SC-55ST (basically a headless SC-55mkII) and 8850 owner, I can provide recordings of the Roland demo MIDIs for both modules if you like. On another note, I noticed too that you mentioned the idea of uploading the WAV soundtrack for Kioh Gyoku before, but since it wasn't too hard to find those songs on YouTube, so I didn't say anything, but I have to say it is really good to hear those song with a higher quality upload. I also saw that for the Kioh Gyoku soundtrack download that we didn't get an AAC upload. Is there a chance we could get that later down the line? I noticed that after managing to organize most of the bulk downloads on my laptop, and since I'm heading back to college soon, I'll have decent chance to enjoy this music. Record at 44.1kHz, 24 bit. This has to be set on both your SD-90 and your DAW. Set your audio buffer size moderately high to prevent clicks while recording. Setting it to 5 should be good. The SC-8850 uses the same DAC as the XV-3080 and XV-5080. This DAC performs only very slightly worse than the one used by the SD-90, which has pretty much noiseless output (for reference, set the LINE level to 0 using the V3 knob). So here's a little test. Set the 8850's volume knob to max and the SD-90's gain knob to minimum, LINE at 100. Play some decently loud MIDI file (something from Shuusou Gyoku or whatever demo MIDI you find the loudest works), adjust the gain until the PEAK LED starts to light up, then pause the MIDI. If you hear noise at this level, in a few cases you just have to move the RCAs around to make sure that no other cable is touching them, but if that doesn't help you probably need better RCA cables. The ones I mentioned on the first post are pretty good as you can hear all over this thread, but Blue Jeans or Monoprice cables should also do the job. The shorter the better, but no need to get something ultra short if it's impractical for you. Record each MIDI with the gain knob set as high as possible, but watch your DAW's stereo input channel and make sure that the highest peak of what you're recording doesn't exceed -3 dBFS. You can safely normalize the recording to -1 dBFS afterwards. I would re-record the MIDI if I found that the recording peaks below -5 dB. Your DAW may have an audio analyzer tool that allows you to check the highest peak for the whole recording with one click. The SC-8850 should be safe to record with its volume knob at max, the level being controlled only using the SD-90's gain knob. You can lower the volume on the 8850 a tiny bit if you're not sure, it shouldn't make much of a difference since the noise floor is so low. The SC-55ST uses older components which may not be able to handle louder parts at max volume so well. You'll have to use your hears here. If things sound weird during louder parts I would try lowering the volume on the SC-55 a little and see if it changes anything. As for the software stuff you mentioned, the one for iOS is so cheap that the inaccuracies don't really matter. I don't know if you can connect them to a computer and use them as a fake hardware module, but if you already have an iOS device just go for it. Don't go buy one just for this app though. I find VA a pointless ripoff. Not only there are noticeable inaccuracies in several MIDI files, the price is just absurd. You can buy a real SC-55 for less (as low as 20 bucks if you're lucky), a SC-88 for about the same price and a 88Pro for just a little more. You could also buy a SC-55+MT-32 which is a fantastic retro computer gaming setup for roughly the same price. If you're a composer looking for bread and butter sounds, just add $100 more and you can buy the full version of Halion Sonic 2, which comes with sounds from the Yamaha Motif XS and XF (it will probably be updated soon with sounds from the Montage), full editability like the JV-1080 and the SD-90 and an interface and preset browser that make sense. VA's interface is a mess, specially if you're using it for gaming. On a real 88Pro, if the BGM sounds weird you can do stuff like switching sound sets or lowering the global reverb while playing the game, you don't even have to pause or look at the module. On VA you would probably have to pause the game, alt+tab then click several times just to make a tiny adjustment that would only take half a second on the real thing. Setting VA up for gaming is also a pain, because it's just not meant for that. A real Sound Canvas is pretty much plug and play even if it's your first time using one. I think the SC-55 is the best for people who play stuff like DOS or X68000 games a lot. If these games were on console this is what the CD soundtrack would probably have sounded like anyway, at least for western games. If you primarily play western games you can get away with buying some $3 chinese USB-MIDI cable instead of a proper USB MIDI interface, which helps keep everything super cheap. These chinese cables can't transmit SysEx, but this isn't a big deal since nearly all MIDI files made outside of japan don't make use of the advanced features of any synthesizer. Sorry for taking so long to reply, I've been feeling kinda dead for the past few days. The refresher course indeed did help with reviewing recording procedure and process. Anyways I've gone and uploaded the 55 (via the ST) and 8850 demos as 24-bit FLAC files - feel free to use these as deemed appropriate. I alas don't trust my connection enough to make YT videos to showcase these, but I reckon these will be a better fit on your channel anyway alongside the rest of the SC line's videos. Now everyone else can also savour the pleasure (read: atrocity) that is the 8850 standard drum kit! I also think I have ZUN's 8850-specific MIDIs lying around somewhere, and I'll probably get around to those in a bit. That would leave the 8820's demo MIDIs, but I think it's better to leave that for others who actually have 8820s or equivalent. This is probably possible via various MIDI interfaces (eg. iRig MIDI plus a proper USB-MIDI adapter) - heck, even Roland's web page for it mentions that as a feature. Alas I don't have an iOS device to toy with at the moment; otherwise I'd look more into this software. Personally I'm inclined to agree, having tried the demo version for a bit in both music and vintage gaming uses. Maybe it could work on a secondary system as a pseudo Sound Canvas for driving another system's MIDI output, but at that point one might as well get the real hardware, yeah? I think the SC-55 is the best for people who play stuff like DOS or X68000 games a lot. That seems to be the 55 line's biggest usage scenario, indeed, and the main reason I have mine. I just wanted to give my personal thanks on using Fraunhofer AAC for the lossy format. In my personal use, it has been the best performing AAC implementation, especially on HE-AAC (for Niconico uploads which really shouldn't fit in 100MB). By the way, do you know any of the pros/cons between OPUS and AAC? I am doing some mass-conversion of songs, and I was wondering if you had anything to say about that. A list of the instruments used is included in the descriptions like always. Making these lists always takes much longer than expected. Note that the SC-55 demos you recorded are actually the demo files included with the Roland SB-55 Sound Brush, which also include the vanilla SC-55 demos, so I've tagged the videos accordingly. I've not heard the SC-8850 demos in forever. I totally didn't realize that the Super Quartet steel guitar demo was an arranged version of the SC-8850 blues demo while I was recording it. I've been always a bit disappointed with these demos because they don't feature the new clavi, harpsichord, santur and sitar at all. These are easily some of the best new sounds on the SC-8850. One thing a lot of people don't notice is that the SD-90 piano is the same as the SC-8850 and SC-88Pro pianos, the later two are just in lower quality. The notes between D and G on the octave above middle C are a dead giveaway, specially if you play softly. I've recorded the SD-90 playing the SC-8850 piano demo. Note how the notes have a more natural ringing to them and a fatter sound, while the SC-8850 piano sounds thinner and almost like an electric grand (think CP-80) when high notes are played. And yeah... That snare sounds like someone slapping a box, barely any punch. They probably went overboard on the lossy sample compression. SD-90's stereo drums aren't the most massive sounding drums either but that's because someone at Roland thought it would be funny if they put mostly unprocessed drums from a professional module into one intended for home users. It's hard to talk about Opus because it hasn't received as much testing as other lossy encoders. One downside is that like its predecessor (OGG Vorbis), it's not as widely supported as MP3 and AAC/MP4. Both Opus and AAC seem to perform more or less the same at around 128kbps+. For a music collection, I would use AAC. You'll be able to play AAC on pretty much anything released in the past 8 years. I would recommend a bitrate of at least 192kbps~, but 128kbps~ should be fine if you don't have the space. The closed source Fraunhofer encoder uses these bits really well. Opus performs better than HE-AAC for low bitrate stuff (100 kbps or less). If you really need to use low bitrate and your player/device supports it, you should definitely use that. (pls help) SC-88Pro: ZUN's MIDIs the way they were intended to be heard. So hm, here's a little announcement. Since I announced that I had finished this project about 3 weeks ago, this thread has received over 2000 views and the full music packs have been downloaded by about 500 people. Most of these views and downloads seem to be from people who aren't registered here, but that's still a lot for such a niche subject. Thank you very much. However, the project is kinda underperforming on YouTube. Everything is properly tagged and titled, the problem is, since there's so many tracks (over 150), the views and likes for these videos are spread too thin. This hurts the discoverability of the project as a whole, because the ranking of videos on YouTube search depend heavily on these two things. It's important for these videos to show high in search because most people go straight to YouTube instead of using Google to look for music. A large portion of the fanbase may not even know that this project exists. -Watch time: This has a big effect on ranking. Watching most of a video tells YouTube that it's probably good stuff. This counts even if the video is being played in another tab or window. -Comments: Big effect on ranking. If you have something to say about any track, just go ahead. Anything goes, and feel free to post in your native language if you have trouble with english. In the past 95% of the comments on my videos were in japanese anyway. -Subscribing has a similar effect to watch time, it tells YouTube that the video must be good. Almost everything I'll post will be related to ZUN or old video game music in some way, so don't force yourself to subscribe if you have no interest on these things. If the only reason why you haven't subscribed yet is because you don't want your Subscriptions feed to be completely flooded with synth demos, keep in mind that it's just the Sound Canvas modules that have a million demos and I've already uploaded all of them. Basically, everything tracked by YouTube analytics helps your videos rank higher in search. If you ever wondered why so many people beg for likes and comments even though they seem completely pointless... Well, that's why. You can help any YouTuber by doing the above. I also made a (completely disorganized) playlist of all ZUN MIDIs I've recorded, just in case anyone needs it for whatever reason. It's 10 hours long! I configured all of my playlists (except the 150 video one above) so that every like, every minute watched helps the whole playlist the video belongs to rank higher in search. Of course spreading the word about this project also helps. Just make sure people understand that these aren't recordings of some random sound module, this is how these MIDIs are supposed to sound. I got this SC-88Pro just for this project, knowing only a few people would care. I admit I came pretty close to giving up on this more than once, but my objective was never to become more liked by anyone or gain any sort of internet fame for recording these. All I want is to give everyone the chance to listen to these the way they were meant to be heard, but there's only so much I can do alone to reach the few who may be interested. Re: (pls help) SC-88Pro: ZUN's MIDIs the way they were intended to be heard. While most of my time has been allocated to listening on my music player, I definitely could spend some more time watching videos and commenting; I've already put my like on every one of your Touhou SC-88Pro uploads as well as subscribed before this prompt, so that much is done on my part. I wouldn't force my comments if it came to that here, but the good news is that I myself can leave genuine comments on most of these since I enjoy them. YouTube can be slow with views, and likely a majority of your YouTube views is from this thread, so eventually, it would need promotion elsewhere, and since the SC-88Pro module is more obscure, the knowledge that Touhou MIDI sound the way the were intended to be heard off this module itself needs to be information more out there and told in other communities that are interested so it's not just limited to one thread on the web. I would post it on something like social media, but I don't bother with those myself. What I also know is that on YouTube searches key words play a pivotal role on finding what people are looking for in searches in both the title and description, and you have indeed done well with key words, but the videos you're are competing with the ones that also do that with stock Windows MIDI Wavetable Synth uploads because those have been on there since early 2010's and beyond, so they've had the time and attention focused solely on them for a while now, and might continue to do, so the things we do to help might not get the videos popular right away because of that. I saw you also made a big playlist with all of the songs you uploaded, but those they aren't all organized yet. Still, bear in mind that getting views on your playlist will also promote them in searches, and your lists do have a lot more views than the videos, which can promote the entirety of the videos and not just a video by itself. I'll do what I can myself, add and organize your videos to my personal playlists, comment on the videos, and even make a big shout-out for this elsewhere, but all that will have to happen sometime later when I have the time. What I can do for now is open up a bunch of playlist tabs, set them those lists on repeat, mute the tabs through volume mixer or by browser tab mute, and let those videos play all day while I'm away at school. I won't mute them through the YouTube player because I'm unsure if the fact that I watched those videos muted would pick up in the algorithms of the site. As for YouTube search, it seems to prefer newer, higher quality videos over old ones for as long as they have sufficient likes and user activity (watch time, comments, people subscribing, etc), so I think we still have a good chance of reaching the top of the search results. In the case of the Seihou 1 OST and arranges, I originally recorded them on another synth (a Roland synth loosely related to the 88Pro) back in 2011, and they used to show at the top of search. I've since deleted them, but they had far more views than the Microsoft GS recordings that are now at the top. These can definitely be outranked with people's help. Page created in 0.121 seconds with 58 queries.